The National Retail Federation estimates that Americans will spend $2.4 billion on Easter candy this holiday season. It's hard to deny the allure of chocolate bunnies and marshmallow peeps, but it's no secret that too much sugar isn't great for kids (or adults). While you might not eliminate all of the sweet treats from the Easter basket this year, here are some ideas for healthy and fun things kids will love. We predict that they'll be so excited about these Easter goodies they won't even miss the chocolate. One of the best parts about Easter is popping open those plastic Easter eggs to reveal the sweets inside. Sugary sweets are one way to fill the eggs, but there are plenty of healthier treats kids will love too. Chopped dates, toddler puffs, trail mix and cheerios all make great snacks. Another good idea is to fill the plastic eggs with coins, fun toys and heartfelt, handwritten messages. Many people view Easter as the unofficial start to spring, and that's a great excuse to stuff your child's Easter basket with toys that encourage them to play outdoors. Jump ropes, sidewalk chalk, finger paint and bubbles are all fun treats that go a long way in filling up that Easter basket. Other fun ideas include a frisbee, a baseball and glove, a soccer ball, a hula-hoop, a badminton set or a volleyball net. It's hard to go wrong gifting art supplies, so stock that basket with coloring books, crayons or markers and spring-inspired stickers. Another fun way to inspire your child's creativity is to give them all the supplies needed for a larger project, like building a bird house or designing a mosaic garden stepping stone. Have a trip to the beach planned this summer? 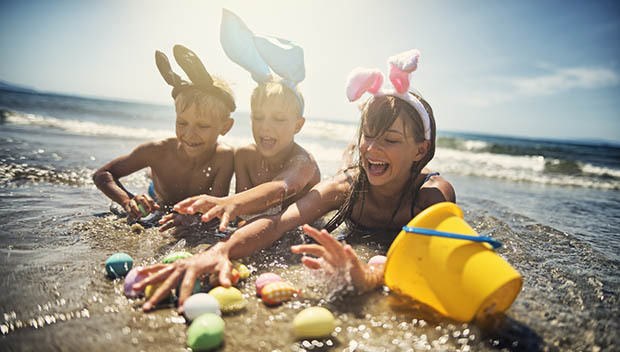 Stock the Easter basket with sand toys, sunscreen, flip-flops, a beach towel, a bathing suit and fun pool items that the kids can take advantage of while they swim and splash the summer away. There's no better way to celebrate spring than by spending time outside as a family, growing vegetables and flowers. A garden-inspired Easter basket is the perfect idea for the little green thumb in your family. Fill the basket with kid-sized gardening supplies and seeds so they can grow their favorite veggies. If your kids are into fairy gardens, consider filling their Easter basket with all of the trappings to create a secret fairy world of their own. Riding bikes is a fun and active way to spend warm spring days. This Easter, get the kids everything they need to safely ride, including a helmet and bike lights, as well as fun accessories like a basket or bell. Turn that Easter basket into a mini-library by filling it with books. For a special Easter-inspired twist, include only books on certain themes, like the story of Easter itself or ones that feature rabbits. Nature-inspired books like field guides to identify birds, trees and plants are also a great Easter basket idea. A camping-themed Easter basket is a great way to get the kids excited about their next night under the stars. Small items like headlamps, a first-aid kit and even a backpacking hammock will easily fit in the basket. Items such as camping chairs, sleeping bags and a tent are camping necessities that make fun larger Easter gifts. If you want to stay away from processed foods but still want your kids to have sweet Easter treats, fill their Easter baskets with all of the ingredients they'll need to make their favorite treat at home. Whether its oatmeal cookies, cranberries muffins or real fruit popsicles, your kids will have a great time cooking (and eating!) their own Easter creations.